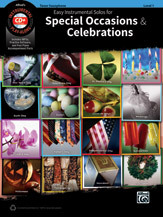 Alfred's Easy Instrumental Solos for Special Occasions and Celebrations series offers a versatile selection of music for flute, clarinet, alto sax, tenor sax, trumpet, horn in F, trombone, violin, viola, and cello. Each book contains carefully edited arrangements appropriate to each instrument, and well-suited for level 1 students. A fully orchestrated accompaniment MP3 CD is provided, featuring each song as a live performance demo track followed by a play-along track. The CD also contains a PDF of the Piano Accompaniment and Alfred's Tempo Changer Software. Titles: Auld Lang Syne (New Year's Day) * We Shall Overcome (Martin Luther King, Jr. Day) * She Loves You (Valentine's Day) * Danny Boy (Londonderry Air) (St. Patrick's Day) * The Irish Washer Woman (St. Patrick's Day) * I'd Like to Teach the World to Sing (Earth Day) * Because He Lives (Easter) * Peter Cottontail (Easter) * Cielito Lindo (Cinco de Mayo) * A Mother's Prayer (Mother's Day) * You Raise Me Up (Father's Day) * Trumpet Tune (Weddings) * Pomp and Circumstance (Graduations) * America the Beautiful (Independence Day) * Summertime (from Porgy and Bess) (Summer) * This Land Is Your Land (Labor Day) * The Chicken Dance (Dance Little Bird) (Octoberfest) * Funeral March of a Marionette (Halloween) * Come Ye Thankful People, Come (Thanksgiving) * Away in a Manger (Medley) (Christmas) * Jingle Bells (Christmas) * You're a Mean One, Mr. Grinch (Christmas) * I Have a Little Dreidel (Hanukkah) * Happy Birthday to You (Birthdays).